Our campaign is known as the REPS ABC, it is an attempt to break the bullying cycle. We aim to educate our learners about the serious problem of bullying so that, not only will they not become bullies, but also that they will become Anti Bullying ambassadors. We also aim to educate learners to the extent that they are able to recognize when they are the victims of bullying. The campaign will run for the entire year. The pre-launch of the campaign started with a professional show produced by Nazlie George Productions, dealing with the effects of bullying on the lives of children. 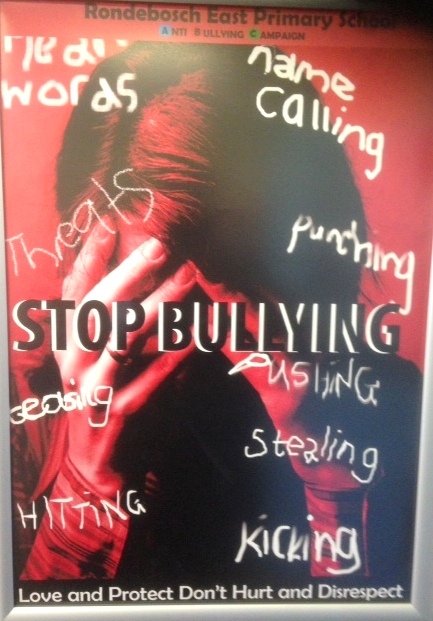 A SLOGAN competition was launched, where learners were asked to develop a slogan that will be used on our official school anti bullying campaign poster. Jodi Adams, grade 7, won the competition with her slogan “Love and protect don’t hurt and disrespect” We celebrated Valentines Day this year with a “Circle of Peace” attended by the whole school to promote a peaceful anti-bullying playground.